Daring to publicly disagree with one professional philosopher is enough to make your hands sweaty but two at once! I had seen many fellow Christians recommending Plantinga’s recent interview with Gary Gutting as a masterclass in arguing that atheism is irrational for several days now but I knew it would be worth waiting for at least one review by an atheist philosopher before commenting. How pleased I was therefore when the atheist philosopher Massimo Pigliucci replied. This statistic remains virtually the same if you restrict the survey to PhDs although those who accept atheism are reduced to 58%. But philosophy is an incredibly diverse subject and anyone who has studied the subject will know that after undergraduate studies it’s possible to specialize to a point where you might well be an authority in one area of philosophy but not in others. Frankly, I’m baffled Plantinga did not bring this matter up. Perhaps he did not feel the need to respond to a question which verges on being an appeal to a logical fallacy. We have, of late, seen some professional philosophers be surprisingly bad at tackling basic arguments within philosophy of religion. I would cite Dennett and Grayling as two prime examples of this. So I do not agree that a person who is well qualified in philosophy is necessarily qualified to speak with authority on matters pertaining to the philosophy of religion. Notice that the statistics almost completely reverse! 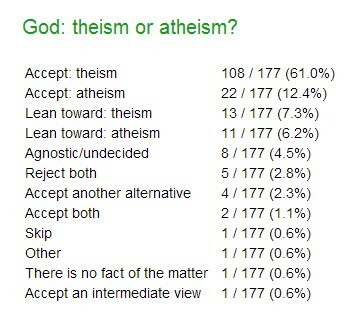 Now it is 61% who accept theism with a further 7% leaning toward theism with a mere 12% accepting atheism. Remember that philosophy of religion is the AOS where someone would be expected to be highly educated and extremely well read in the arguments for and against the existence of God. Now it is at this point that the objection will be raised, “Surely that statistic is so high because atheists are less interested in philosophy of religion than theists are.” But notice the exact same argument can be given to explain (explain away?) the former statistics too. 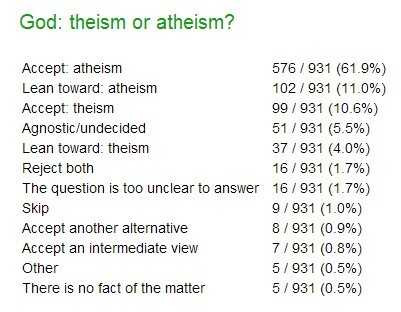 Maybe it’s the case that philosophy tends to attract more atheists than theists and that’s why there are more atheists than theists in philosophy in general. The point is that the survey does not explain this. It does not tell us the grounds upon which the atheists are atheists and the theists are theists. This is why Gutting was being naive or naughty (or both) in bringing these statistics up in the first place and why I wish Plantinga had challenged him more on them. The mere statistics on their own simply do not tell you the reasons why certain philosophers have come to the conclusions they have. I hate to have to point it out to Pigliucci but Plantinga is not, technically speaking, a theologian. He is a philosopher. He is one of the most discussed philosophers of modern times too. If you look up H-index results in the philosophy of religion and in epistemology Plantinga comes out very highly. If Pigliucci is only hearing about Plantinga second-hand instead of reading him first hand then that’s a pretty damning indictment of how little serious epistemology Pigliucci is reading. Please take the time to look at footnote 2 if you doubt how seriously Plantinga is taken as an analytic philosopher. It is also the case that it is pretty hard to tell the difference between theology, philosophy of religion, and epistemology both in this interview and elsewhere when discussion of God is raised. I’m not saying they are the same subject by any means but they have substantive overlap. I already know that Pigliucci has it in for theology but I think he is attempting to discredit an academic subject without warrant and I have asked questions about whether theology (especially some forms of it like analytic theology) can be quite so easily separated from philosophy previously so I won’t do it again. Suffice to say, I am still yet to hear a good reason why analytic theology cannot be regarded as an academic discipline. I often see disdain but that’s not an argument is it? Perhaps that’s why the vast majority of academics aren’t convinced also? Of course, it’s only a non sequitur in the sense that modern atheism has become far more agnostic. A more charitable way of interpreting Plantinga, to avoid accusing him of a non sequitur, would be to say that Plantinga means ‘atheist’ in the old sense or the sense still found in philosophical dictionaries (which is sometimes called ‘strong atheism’). Still I think the point is fair in that most atheists, these days, claim they are not drawing a conclusion (although whether they then live up to that claim is another matter) but assigning a high probability. 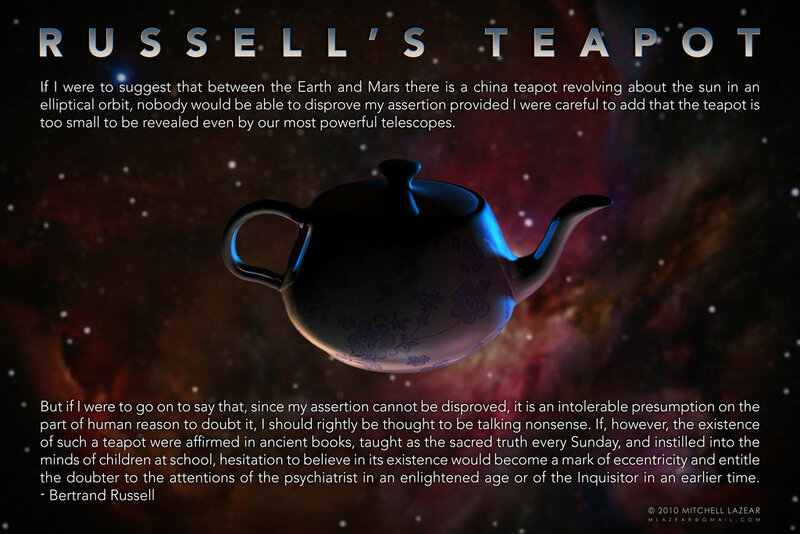 Plantinga also makes reference to Bertrand Russell’s notorious tea pot analogy. He points out that what makes the teapot disanalogous is that teapotism is regarded as irrational not because of a lack of evidence but because of very strong arguments against teapotism (because of what we know about tea pots and the logistics of putting them into orbit). Pigliucci thinks that equally strong arguments can be brought against the hypothesis of God existing and so he likes the analogy. But this is clearly where Plantinga would disagree with Pigliucci (as would I). I don’t think that there are arguments as strong against the existence of God as there are against teapotism so a conversation would need to begin on what these arguments are and how strong they are. This is where Plantinga annoys me most. He is famous for holding the view that belief in God can be rational without any arguments in favour of theism (belief in God is ‘properly basic’) and yet he concedes that the evidential problem of evil  may well count as probablistic evidence against God existing. Instead of using his own epistemological paradigm he appears to be borrowing the cumulative case approach made famous by Richard Swinburne. That is to say, he thinks the rationality of God is made due to the fact that there are more arguments which are stronger arguments in favour of theism as opposed to the one argument from atheism (the evidential problem of evil). So is Plantinga an evidentialist or is he not? It would now appear that what makes theism rational is the cumulative case rather than an appeal to God being a properly basic belief. I’m left confused. I will assume that, even though Pigliucci’s formal AOS is not philosophy of religion, he does know that there is not just one form of the problem of evil and that what is being referenced by Plantinga is only the evidential one and not the logical one. Pigliucci has left himself open to being misunderstood here and I wish he had been clearer. He will later criticize Plantinga for not making a distinction between materialism and naturalism but he ought to be making just such a distinction here and he doesn’t make it. Pigliucci jumps on Plantinga’s reference to the sensus divinitatis as a reason for being justified in thinking God exists. Pigliucci uses the analogy of UFO experiences (terrible analogy by the way) and points out that individual sightings do not constitute sufficient evidence for everyone to believe. But here I think he misrepresents Plantinga since Plantinga is not talking about the sensus divinitatis being a strong argument for everyone to believe but rather being a sufficient condition for the individual who has the experience being justified in their belief. I think that distinction is missed by Pigliucci here and it leads to an unfair judgement that it is “so weak that it is hardly worth rebutting…” If an interpretation of a professional philosopher is so weak it’s hardly worth rebutting it’s likely the interpretation is wrong rather than the philosopher. I completely disagree. The fine-tuning argument is quite obviously not a god-of-the-gaps argument since it’s not based in a scientific gap in knowledge but based on what physicists claim to know. It’s not that physicists don’t know how remarkable the statistics are for the values of the constants of the universe and therefore an argument is based on a gap. Rather the argument is based on the fact that scientists have worked out conservative estimates for these values and laws being what they are and the chances of them all being what they are make for truly astounding odds. The only way the fine tuning argument could be refuted is if the figures were shown to be vastly incorrect. That’s not a gap. The fine tuning argument is based on what physics claims to know. The other sense in which the fine tuning argument is not a god-of-the-gaps argument is that it is a philosophical argument appealing to agency and not a replacement for a scientific theory attempting to explain some material cause. This makes me wonder whether Pigliucci has read enough Swinburne to be commenting on this argument. Gutting’s response, when Plantinga brought up the fine tuning argument, is a common one but very misplaced. Of course the fine tuning argument does not prove the existence of an “all-perfect being” and no-one I know who uses it thinks it does. But if it is a good probablistic argument for God then that is part of a cumulative evidential argument for the existence of God. I’m not sure if Pigliucci is just expressing his feelings here or attempting to make an argument. It must simply be the former since I cannot see an argument. Of course we don’t feel the world is magnificent when we suffer but the question one must answer, if one is to create a strong evidential problem of evil argument, is whether or not there are sufficiently good reasons for God to permit evil and suffering in our short lifetimes. It is simply a fact that atheist philosophers have struggled to convince even their peers that they have managed that task. Gutting returns to where he began and asks Plantinga why so many philosophers are atheists if atheism is irrational. Plantinga replies by using the atheist philosopher Thomas Nagel as an example of a possible explanation since Nagel has suggested that his disbelief is not based on rational arguments so much as the fact that he does not want God to exist. This appears to be a fair reply. Asking why there are seemingly rational people who disagree with a view is only interesting if they can answer for themselves and Plantinga appears to agree and does not want to speculate too much. It’s quite obvious that Plantinga does not believe in a God who is a “cosmic puppetter” so Pigliucci is really just ranting here. I’m going to finish with two things I find confusing. As I read him, Pigliucci appears to be claiming that the advancement of human knowledge, thanks to modern science, appears to make it self-evident that reason leads to truth but this appears to assume the very thing being asked in my opinion. It also sounds like an appeal to pragmatism. Just because what we think we know allows us to make things faster and to build incredible machines does not mean we know what is actually true. It could equally be the case that what we ‘know’ (or think we know) is merely helpful to our survival. So Pigliucci’s appeal to human progress I find to be lacking. That would be like a moral realist appealing to moral progress as an argument for moral realism. That just isn’t convincing because it is presupposing the very thing it’s trying to demonstrate. What I would like to ask Plantinga is why he talked about materialism in this interview instead of arguing against naturalism. I’m also curious as to why he flirts with some form of evidentialism when, ultimately, he rejects that epistemology. What I would like to ask Pigliucci is how he thinks naturalism can give a better account of reason than theism can. I would, again, also like to know how he manages to have such disdain for theology when he tries his hand at it himself and why he would attempt to belittle Plantinga by calling him a theologian (as if that is some kind of slur). Pigliucci does appear to want to be taken more seriously than the New Atheists but if he does he will need to stay above these kinds of tactics. Richard Dawkins already tried doing exactly this same thing when, in The God Delusion, he incorrectly called Richard Swinburne a theologian instead of a philosopher. I take Pigliucci far more seriously on philosophical matters than I do the New Atheists but if that is to remain the case he will need to refrain from attempting the ad hominem low blows they all too frequently make. It may well help the New Atheists sleep at night to think they can write off all Christian philosophers as mere ‘theologians’ but this is factually incorrect and requires blind faith in the teeth of evidence to the contrary. I have in view here Dennett’s woeful attempt to interact with theistic arguments in his Breaking the Spell (for example, he cannot even describe the cosmological argument correctly which is something a first-year undergraduate in philosophy of religion would be expected to do as a basic matter of competency) and Grayling’s equally poor attempt at some philosophy of religion in his The God Argument. I have already explained some reasons for not taking Grayling seriously here due to the fact that he could not even correctly represent the moral argument. Here you have two very highly-rated professional philosophers who are doing philosophy of religion at a standard which would be causing them to fail at undergraduate degree level. Not to be confused with the ‘logical problem of evil’ which most philosophers have agreed is not a sufficient disproof against God. See here for my overview. Knowledge of God: Alvin Plantinga and Michael Tooley, Great Debates in Philosophy series, Blackwell, 2008, p.31. The God Delusion, Richard Dawkins, p.176. Swinburne did correct Dawkins on this matter but never, so far as I could find out, received an apology. This entry was posted in Atheism, Epistemology, Evidentialism, Philosophy, Theodicy and tagged Alvin Plantinga, Anthony Grayling, Atheism, Massimo Pigliucci, New Atheism, Richard Swinburne, Theodicy. Bookmark the permalink. In your comment regarding theology and philosophy of religion, from a layperson’s perspective, here’s how I see the difference. Theology makes the assumption that (1) God exists and (2) God is a deity that communicates with human beings. In philosophy of religion, these are open questions: theology could be divinely inspired but it could also be just a manifestation of human culture. I should note that I think the study of the theology does have value. In my political science MA thesis, for instance, I studied how theological differences can influence values, political attitudes, policy preferences, and assumptions about human nature. Theology in this respect can have a real world impact. However, theology becomes less relevant to an atheist in the cosmic sense. Let’s say a United Pentecostal minister and a Southern Baptist minister go at each other on the merits of the doctrine of the Trinity. For a Christian theologian, the truth of either position has enormous cosmic significance. But for an atheist (and perhaps many non-Christians in general), this debate would be kind of like listening to two Dungeons & Dragons enthusiasts argue whether Tiamat or Orcus would win a fight. Yes I agree that is how most people would see the subject from the outside. However, there are plenty of theology degrees which include the study of different religions which would challenge #2. One would also be expected to study deism in theology as well. It’s also not uncommon for a theology degree to study natural theology which is, of course, the traditional arguments for the existence of God. One does not have to conclude either that the arguments work or that God exists in order to get a theology degree. But it is true that a lot of theology is about what religions mean by God and understanding the specific doctrines of certain religions that is true. I’m glad you can see theology as having academic value and I would have thought that any serious study of anthropology will require frequent overlap with theology. I think the problem comes at exactly the point where you say it is less important. After all, many modern atheists try their hand at theology all the time. Richard Dawkins does so frequently in his book ‘The God Delusion’ and Pigliucci is commenting on matters of theology frequently enough himself. How they can then turn around and disparage professional study of the subject they themselves are trying their hand at beggars belief. I agree with you that listening to a discussion about the finer points of some theological doctrines would appear less than interesting to an atheist but that does not make them any less important and if they took the time to listen to those discussions sometimes then perhaps they wouldn’t misrepresent their theological opponents as often as they do? A really interesting article. I had similar problems with Pigliucci when he analysed Plantinga’s EAAN last year. A quick question: what did you think of Piggliuci’s claim that thoughts/beliefs are instantiated by material processes? I still find there’s a “gap” in this kind of account, but can’t quite put my finger on it.